New Wave Domesticity: Celebrating the Chinese New Year with Pork Goyza! Today is the Chinese New Year! Welcome the Year of the Horse! To celebrate, I made one of my new favorite recipes - pork pot stickers (goyza)! Jiaozi dumplings are a traditional Chinese New Year dish in northern China and are often shaped into an ingot coin shape because eating them is said to bring prosperity in the new year. Mine might not be as pretty as traditional dumplings, but they are just as delicious and I am excited to make them again and get better at my folding skills! This may seem like a daunting recipe because there are a lot steps, but they are all super easy and the results are fantastic. The dumplings are wonderfully filling these would make a real WOW for an party appetizer, or you could just make them for dinner as a fun way to switch things up for your family. 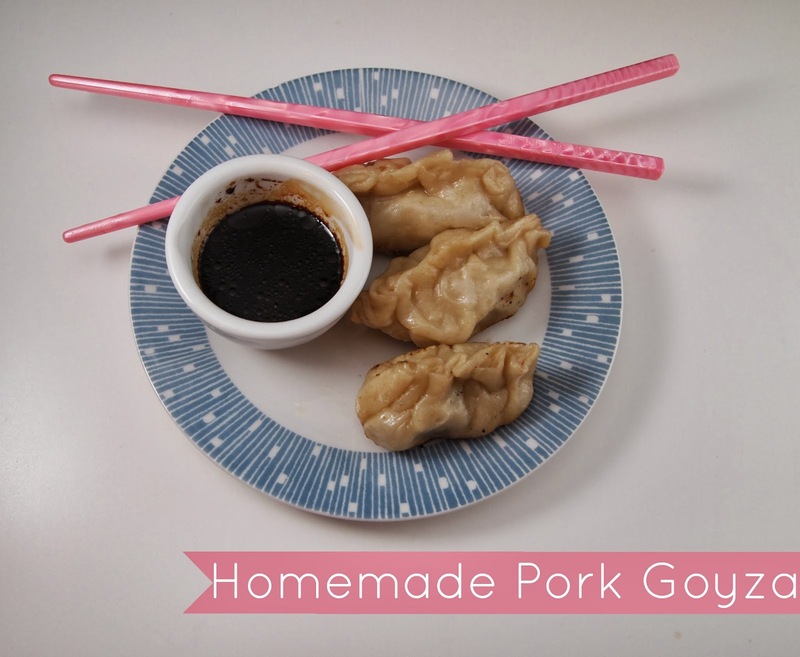 My husband and I made these with a stirfry, but they were so good that we ended up just filling up on dumplings and just saved the stirfry for a massive left-overs the next night! 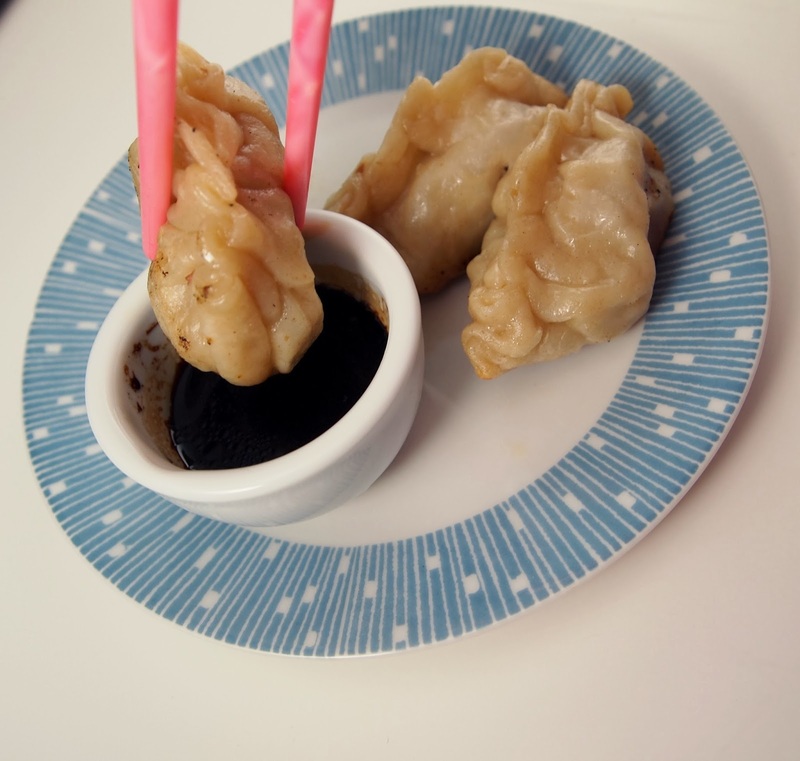 You can use premade wontons, or just make this 3 ingredient dough yourself. It is super easy to put together and really rewarding and I'm sure you already have all these ingredients on hand! The dough is nice and tender and a little thicker than the usual wonton wrappers. My husband & I both just loved them! Using a dough hook on your stand mixer, combine ingredients and mix until a smooth ball forms. Mix on medium-high speed to kneed the dough for about 5 minutes. If you don't have a stand mixer, you can mix the ingredients using a chopstick and let them sit for a few moments until cool enough to kneed by hand for 5 minutes. Cover dough and let rest for one hour. Divide the dough into 4 sections and the roll each section into about 1" logs. Cut into 3" pieces. You should end up with about 20-30 peices. Roll into balls, flatten, and roll out to about 1/8" with a rolling pin. Be sure to flour your surface to avoid sticking. As you work, cover your pieces with a wet paper towel to keep them from drying out. Mix all ingredients by hand until fully combined. Assemble the dumplings by adding about a teaspoon of filling to the center of each. Wet the edge of one side, fold over, and seal by pinching the tops. You have several options when it comes to cooking, you could steam, fry, or boil them. I really love the traditional goyza option of frying & steaming...it gives a really great crunchy bottom and a soft pillowy top. To do that, put about 2 tablespoons of vegetable oil in a large skillet, heat to medium-high heat until the oil is hot and glistens. Add dumplings and cook for about 3-5 minutes until the bottoms are browned. Add about 1/3 cup of water to the pan and quickly cover with a lid. Turn down to medium and allow the dumplings to steam for about 20 minutes. Whisk all ingredients together and serve along with your dumplings. These are my favorite thing to make! I would LOVE to trade buttons with you, sweetpea! Let me know if you're interested. They look delicious! And nice photos!